Study predicted the worldwide output of synthetic diamonds to reach 20 million by 2030. The cause for the increasing output is due to the growing demand for precious gems. The survey led by the PHD Chamber of Commerce and industry projected that the output of the mined diamonds will soon deplete to 62 million carats by 2030. PHD Chamber of Commerce and Industry forecasted that the global manufacturing of the synthetic diamonds is estimated to touch 20 million carats by the year 2030. It is expected due to the rising demands of the precious stone in the jewelry market. As per the study, the production of the mined diamonds will deplete approximately to 62 million carats by the year 2030 from the current level measured, i.e., 125 million carats in 2015. While the demand for the diamonds will rise to 221 million carats by the year 2030. The current manufacturing of the synthetic diamonds is 3,60,000 carats, which is gauged to get up to more than 20 million carats by the year 2030. The faux creation of diamonds contemplates sustainable and pertinent source, thus keeps up the ecological balance as well. 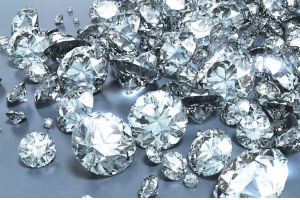 It is clearly recapitulated in the study that diamonds created by the scientists in the diamond greenhouse rather than created in the earth's crusts resembles the diamonds originally grown in the earth’s crust in all the ways. Both scientifically grown diamonds and the earth mined diamonds holds the similar properties, whether dispersion, specific gravity or hardness or refractive index. Today, synthetic diamonds are imported to India from foreign countries, i.e., Singapore, United States, Russia, Europe, and Malaysia for polishing/ cutting and then re-exported.